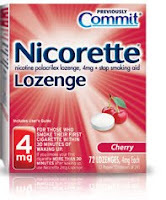 Commit, the #1 doctor recommended stop smoking lozenge, has joined the Nicorette family. New look. New name. Same great lozenge. Nicorette Lozenge dissolves slowly to help soothe cravings and continues to work even after it's gone.